Feisty 208 the better drive but what price a French hatch with the proportions and presence of a supercar? ► Can the new Pug keep up with the old dog? At a Silverstone Auctions sale in 2015, a 1981 Renault 5 Turbo 1 achieved £61,875. Mid-engined, rear-drive and with dramatically engorged bodywork, the homologation special is unsurprisingly collectible as it homes in on its 40th birthday. The 2001-2005 Clio V6 was its successor, with shopping turfed from the boot and replaced by a thumping V6, its body-shell so wide it’s almost square in plan view. Good cars change hands for £22-25k, and just 1018 were produced; they could soar to Turbo 1-like heights in the not too distant future. Hold on a second though: £23k also buys a new 208 GTi by Peugeot Sport, the car that kick-started Peugeot’s hot-hatch renaissance. Which deserves your cash? The crazy Clio came in Phase 1 (2001-2003) and 2 (2003-2005) flavours. The Phase 1 cars were produced by Tom Walkinshaw Racing, and were criticised for lacklustre performance, a sloppy gear change and a chassis that’d swap ends like a waltzer in a hurricane. Renaultsport sorted the Phase 2 with a 25bhp hike, revised suspension, a longer wheelbase (by 23mm), a tickled gear linkage, tighter gear ratios and shorter final drive, plus new Michelin Pilot Super Sports. Most clearly identifiable by its facelifted Clio headlights, our car is a Phase 2. First things first, this is no oversteery monster: Renaultsport dialled in more understeer to the Phase 2, so initial trepidation gives way to confidence, and you pile into corners leaning on that understeer cushion, throttle squeezed. The V6 rides well too, keeping even the bumpiest B-road surfaces from disrupting progress. Naturally, the V6 dominates. Smooth and gutsy, it starts to intensify by 5000rpm, and really rewards a run beyond 7000rpm. But it lugs a chunky 1400kg, so the 208 GTi – 1160kg and 205bhp for an only slightly inferior power-to-weight ratio – doesn’t shift from the Clio’s rear-view mirror, and actually has the edge at times. And the 208 is more fun through corners. The Peugeot Sport version uses upgrades from the 208 GTi 30th Anniversary: 18-inch alloys, four-piston brakes, Torsen differential, wider track, uprated suspension. The damping is firm but far from ridiculous, the brakes are mighty (if mighty over-sensitive) and you can feel that diff clawing for the apex like a cat dragged from its supper. 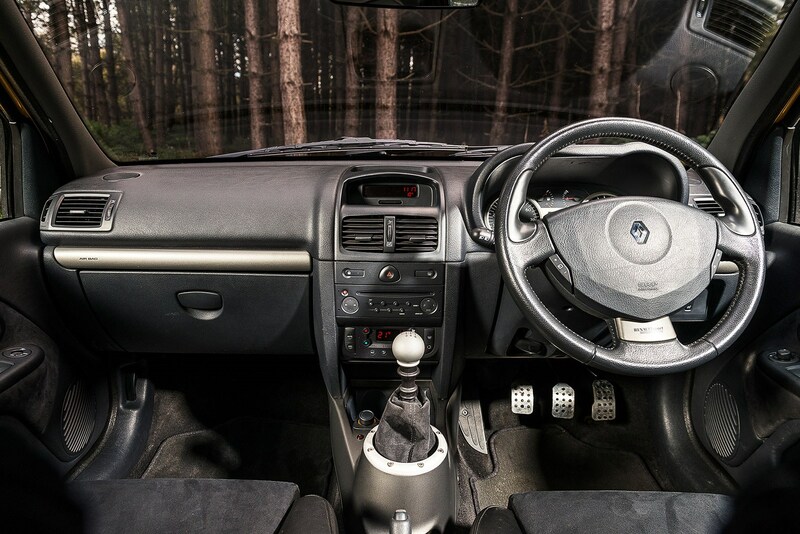 The steering feels super-quick after the Clio, and when you turn in – even laying off the power – the front tyres describe an arc like they’re attached to a draughtsman’s compass. The price you pay is less easy-going steering than the regular GTi; the Peugeot Sport’s steering self-centres aggressively, and tugs around under power like a divining rod. There’s a competition-car-like seriousness here, which is both flawed and key to the GTi’s likeably frenetic character. So too is the lift-off oversteer; you’ll wind on opposite lock in the front-drive Peugeot far more often than the mid-engined Clio. 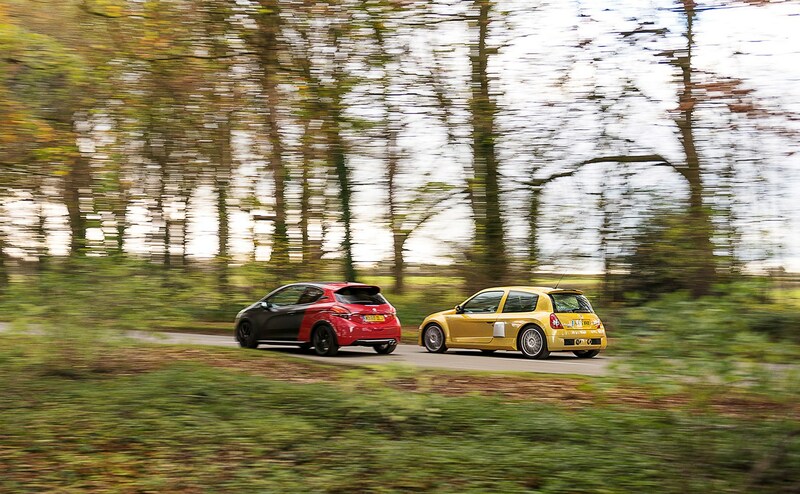 Over a tricky B-road, the conventional hatch is faster, and more entertaining too. We weren’t expecting that. V6 Clio servicing is based on 12k/two-year intervals. SG Motosport (renaultcliov6.com, 01666 511191) quote £170 for an annual oil and filter swap, with the four-year/24k service also including the air filter, for another £150 or thereabouts. Cambelt changes are at five-year/72k intervals. You’ll pay at least £1200. The 208 has one-year/12.5k intervals for ‘arduous’ use, 20,000 miles for ‘normal’ use. Peugeot offers service plans: three-year/35k plans are £12.99 a month, rising to £13.99 for both four-year/45k and five-year/55k options. Insurance is keen for both cars, Adrian Flux quoting £250 for the Clio and £219 for the 208, based on a 40-year-old male. Clio V6 specialist SG Motorsport cites a number of issues. Phase 1 afflictions include corrosion on higher-mileage examples; tatty brake calipers, and damaged/missing lower front splitters that are no longer available. Phase 2 issues include clattering camshaft dephaser pulleys (£187, but requires engine removal, so best performed with a cambelt swap) rattling dual-mass flywheels, broken starter motors (£452 fitted), cracked front springs (£180), dicky washer pumps for the windscreen and headlights (£75) and steering wheels that warp in the sun. On both models, air-con pipes can corrode and leak (there are nine pipes, some no longer available, average price £250! ), catalytic converters can crack (usually welded as replacements are no longer available), and coil packs may fail (£35 each). With the youngest cars now celebrating their 10th birthdays, SG Motorsport has carried out a number of cambelt changes over the last year. It involves engine removal, and costs just over £1300 all in, with the cambelt and auxiliary-belt kit. With the engine already removed, owners sometimes take the opportunity to replace the dual-mass flywheel, clutch and slave cylinder, saving seven hours’ labour. It costs £1469. 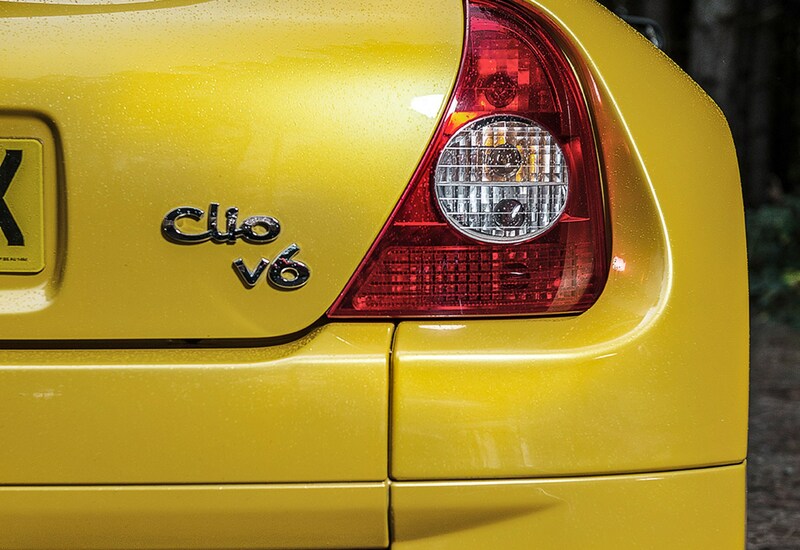 For more info, visit v6clio.net, a comprehensive resource with information on over 90% of UK cars. The 208 is covered by a two-year unlimited mileage warranty, rising to three years/60k for cars maintained in the Peugeot dealer network. Extend it for £250 annually. Special ‘i.d’ colours were offered throughout the V6’s lifespan, and nappa leather was available in light or dark grey, brown, beige and blue, though only until early 2004. Four leather option packs were offered. 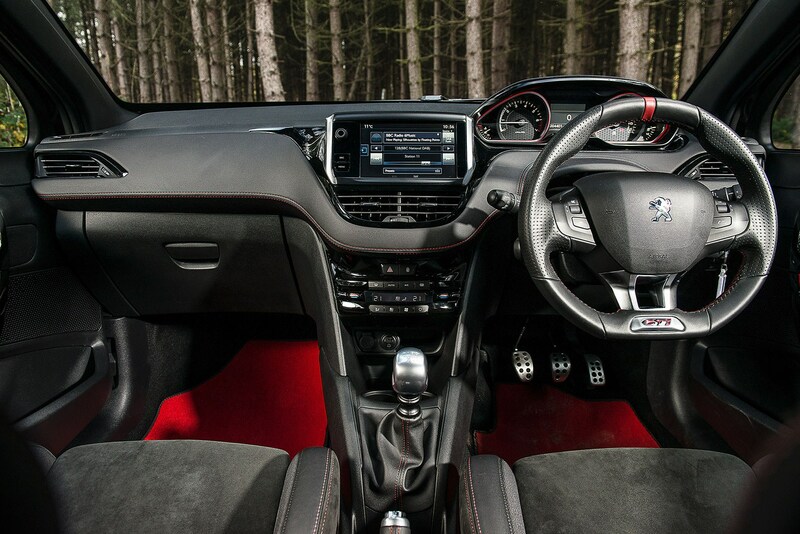 Pack 1 featured nappa leather on the handbrake and gearlever gaiter, steering wheel and dash. Pack 2 added nappa to the seats and door panels, while Pack 3 combined Packs 1 and 2. Pack 4 added nappa to the engine cover and alcantara to the headliner and pillars. Nera Black and Rioja Red paint is standard on the 208, Ice Silver and Satin White £150, while Peugeot wants £945 for the Coupe Franche cut-and-shut you see here. SOS assistance and DAB radio is £250, sat-nav and DAB £450 (or £700 all-in). Active city brake is £250 and the reversing camera £200. The Clio V6 remains a special steer, with a great engine and chassis, in Phase 2 guise at least – it’s more forgiving than legend suggests. This is also a seriously rare and relatively affordable machine to run, and one that looks a solid investment. But if you’re looking for the best drive, buy the Peugeot. The 208 is at least as quick as the Clio, but it’s the handling that defines it – a combination of mighty traction, crisp grip and an adjustability that’ll have the experienced hooting with laughter and rookies disappearing backwards through a hedge at the first exploratory prod of the ESP. 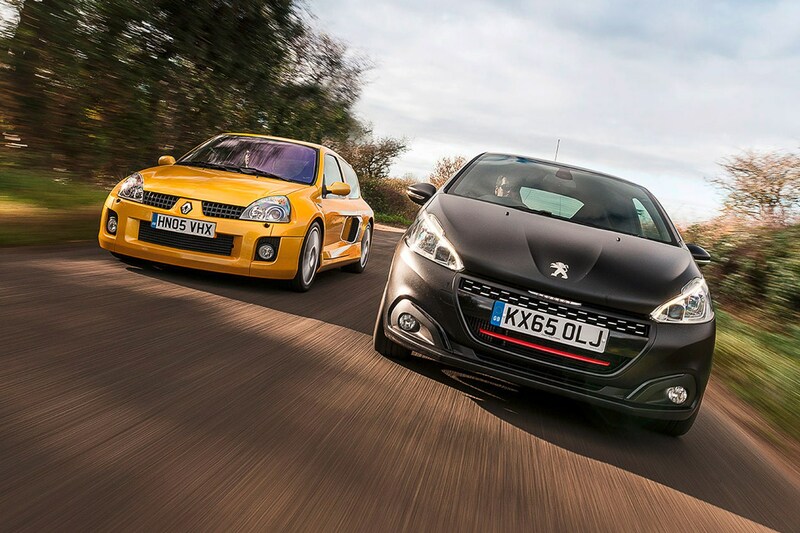 It’s like the best of the old-school French hatches, only with a more intense attitude. Throw in that new-car security, and rear seats and a boot you can use, and we’ve got our winner. Nice work, Peugeot. I bought my 208 GTi 30th Anniversary new in March 2015, after a standard GTi; the difference is amazing. The limited-slip diff and lowered suspension provide staggering grip, and the ride isn’t too harsh, even on rough roads. The power delivery is incredible, yet I’ve seen 45mpg on motorway runs, dropping to 36mpg in town, and I pay £120 tax. Downsides? The sat-nav doesn’t do postcodes, and it’s been back to the dealer for an engine software update. I own one of only four Phase 2s in Lunar Grey, and I’ve covered 17k of 45k miles with no problems at all. I looked at Porsches first, but I didn’t think they had the quirkiness or character. The V6 has one of the best soundtracks of any car at this price, and it’s a very engaging drive, nothing like a front-drive Clio – you do have to treat it with respect in the wet! So far so Clio, but you’re always aware of the the V6 at your back 208’s tiny, bagel-esque steering wheel odd but you get used to it Looking for the standard Clio within? 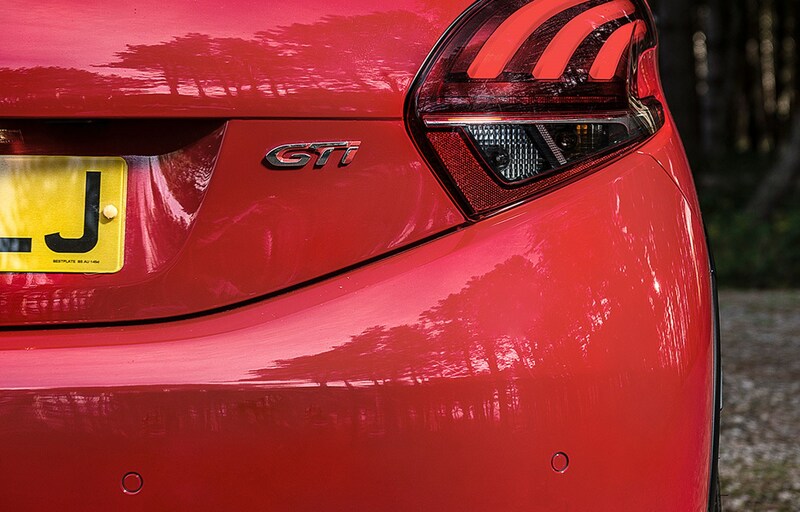 Keep digging… Peugeot Sport 208 worthy of the GTi badge Feisty 208 the better drive but what price a French hatch with the proportions and presence of a supercar?